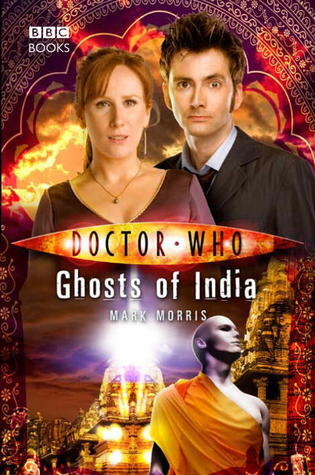 Set between the Tenth Doctor stories, Planet of the Ood and The Sontaran Stratagem, Ghosts of India sees the Tenth Doctor and companion Donna Noble, played by Catherine Tate on the television arrive in India in 1947. I have always been a big fan of the historical adventures in Doctor Who, I'm not fused if they are pure of pseudo historical, I love them because I am fascinated by history. And that was why I was really looking forward to picking this book up. And I am glad I did. Donna has a craving for curry, I suppose one would be hungry after Planet of the Ood, and so the Doctor decides to take her colonial India because he has a friend who he saved from an alien infestation who promised him any meal he wanted, he could have for free. Of course, this being Doctor Who, the TARDIS gets its timing off slightly and lands the pair in the middle of Calcutta in 1947, and those of us who know our history know that isn't a good time. At this time India is in upheaval that will one day lead to its independence from the UK. But in addition to the Indian people rebelling against their English overlords, there are rumours of 'half-made men', roaming the streets who have shadows where their eyes should be. Like the majority of historical adventures, pseudo or otherwise, the Doctor meets a historical figure and in this case it is none other than Mohandas 'Mahatma' Gandhi. And like all of those historical adventures, the Doctor gushes when he meets him. In this same sequence there is a brilliant scene where the Doctor and Gandhi discuss how similar their belief systems are and how vastly different. There is a general camaraderie between Gandhi and the Doctor and then later Donna that is handled spectacularly by author Mark Morris. I loved how Donna asked Gandhi some of the most inappropriate questions like "Don't you ever get the urge to do something naughty?" Only a character like Donna could have asked someone like Gandhi a question like this, but their scenes are some of the best in the entire novel as Gandhi seems to understand Donna's soul and being like Donna understands Gandhi's. And as for those otherworldly elements in Ghosts of India, not everything is as it first appears and I will admit that I didn't see the role reversal when the real threat is revealed, coming! And the way Morris handles dispensing with the threat is handled very well. I also liked that the Doctor gave Donna the responsibility of saving the people of Calcutta from the machinations of the villains, something she does well. Mark Morris also gets the characterisations down to a tee. The Tenth Doctor is his usual manic self, though I couldn't get used to the Sonic Screwdriver just being called the Sonic! Donna's in-your-face manner is handled well, especially when she challenges those in charge and the racism that plagued the country at the time. She isn't afraid to say what she thinks, even if it infuriates those around her. Even the minor characters, especially the Campbell family, are given backstories and descriptions that help to invest them in the story, though I was annoyed that there wasn't something going on between Adelaide and her co-worker Edward. And Gandhi is handled terrifically, Morris injects a real sense of maturity into the man, who could have come away feeling like a terrible pastiche of one of the most influential men in the whole of history.